Need a quick last-minute gift? 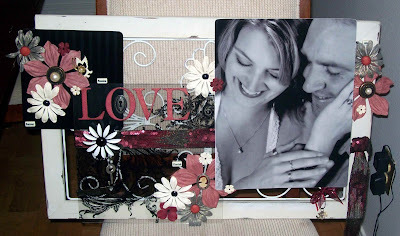 Kits2Remember metal panels are a great foundation for a number of holiday gifts. For starters, here is the No. 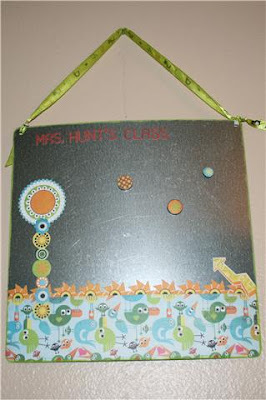 1 item created with these - magnetic message boards! I made 12 x 12 and 8 x 8 message boards for my sons' teachers this year. They really thought they were cute. Last year, I used 4 x 4 and ATC-sized metal panels to create tree and wreath ornaments. I found a framed metal wall-decor candle holder at a local flea market for next to nothing. This black and white photo of my friend, Brynn, and her husband was just too pretty to keep in an album, so, for Christmas, I decided to create a romantic home decor piece they can enjoy every day. I used a Kits2Remember 12 x 12 acrylic panel for the lower left side, overlaid with a Creative Imaginations transparency, and a cover 8 x 8 chipboard sheet, to balance the 11 x 14 photo. I backed the photo with a metal panel 1) for support and 2) so that it can be easily removed and replaced with an updated photo later on. I adhered two large, strong magnets to the top of the frame and just set the photo panel on top. I added a sponge behind the photo for the panel to rest on. Glossy Accents was my adhesive of choice in this case - it is strong and clear. But the metal frame was not the only items here that I found at the flea market. 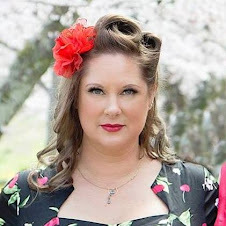 The large pearl flower centers are actually vintage clip-on earrings that no longer had mates. I pried the clips off the back and glued them to the flowers. Chipboard alphas, some ribbon and plenty of Prima, Fancy Pants and Bazzill paper flowers completed the main list of embellishments. Brynn said her favorite color paired with black and white was burgundy, so, using Distress Ink and Glimmer Mist, I did my best to take those reddish tones and use them throughout the piece. It's important to do your best to plan ahead in a project like this, trying designs out before gluing them down, but also be flexible if a design doesn't particularly work the way you had envisioned. For example, with the careful weight balancing act I did with the different elements, the entire project can still be hung by a single nail or screw by the center loop in the metal wire. I has also planned to use "word bubbles" (Tim Holtz Fragments adhered to some Teresa Collins "Family Matters" paper), but the design was just too busy with them, so I took them off and will use them in another project at some point. I am really pleased with the way the project turned out and I hope Brynn is, too! This tiny photo doesn't do it justice, but I am hoping to get a larger one. Basically, it is two 6 x 6 acrylic panels and 14 (for 0-3 and 0-9) of the 1.75 x 2.25 acrylic panels. Tie the bottom of the "A" frame with ribbon so that it doesn't open too wide and fall, and then use the Bind-it-All and o-wire or a Crop-a-dile and o-rings to bind the top. Colleen then also used acrylic paint dabber and Stickles to create the "snow." Super cute and easy! Seeing Colleen's project inspired me to Google "acrylic Christmas countdown calendars," and there were so many cute designs. Be sure to take a look for yourself! ... 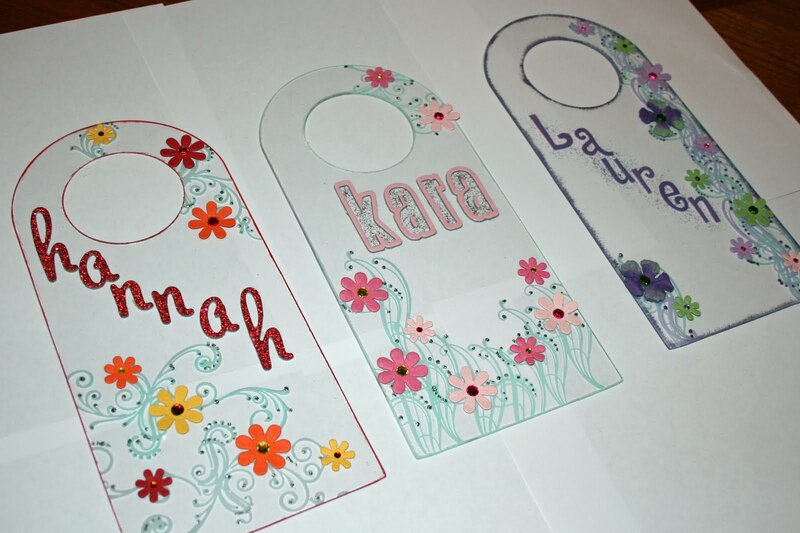 I am posting some gifts I have made for my kids' cousins, Kara, Lauren and Hannah. This year I am making almost all of my gifts, as I am sure many of you are, too. Is that what we scrapbookers, paper crafters and rubber stampers do every year?These acrylic door hangers are cute, simple and fun to do. 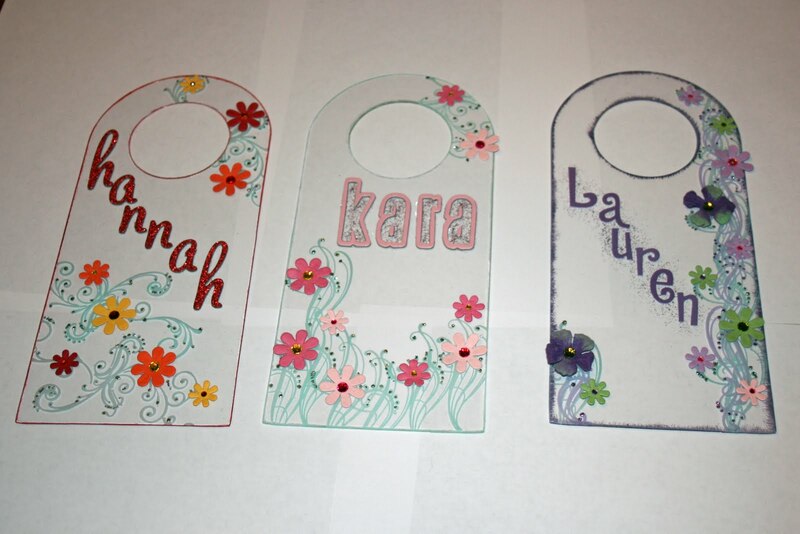 The plain door hangers are in the Kits2Remember store for $3.99 each. 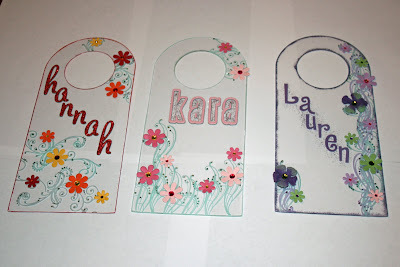 Then, I just used my stash of scrap supplies to embellish these. K2R rubber stamps and pastel Staz-On ink gave me the "foliage" to put the Petaloo paper blossoms on (I used Glossy Accents, which dries in about 5 seconds). I used some leftover chipboard and sticker alphas from earlier projects and finished up with some Stickles glitter glue accents and acrylic paint along the edge of each hanger.